I've never created a zombie look before and was super excited to do this today and then realized I didn't have exactly what was needed. I made due with something I find just a satisfactory for a temporary look. 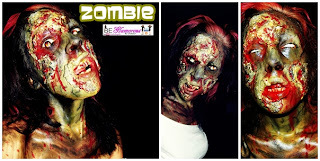 I invite you to check out my video to see how I created this SCARY ZOMBIE look. In about 30 minutes I am about to watch The Walking Dead.. I love watching it for the makeup, gore, and dramatic and well written scenes. That show inspired me to FINALLY create a zombie look. Everyone has their own way and you can definatly go all out doing this. This look took me a little under 20 minutes to create. Imagine the possibilites. Play with skin tone, the degree of "age" and "rot" the zombie has. The more time you take the better it will look.